Here is a case of a good owner getting stuck with bad architect or contractor work. We share these not to pick on the owner or his team but as a lesson that we are happy to help early in the design process to make your laundry room function better and be cheaper to build. This concrete pedestal was poured 24" high. 6" would be sufficient. The laundry workers will have to stretch to operate the controls. It wasn't much fun getting the machines up there. This dryer bay was inexplicably just four feet deep. With three feet of clearance behind the dryers that leaves the dryers only sticking into the bay one foot. You can see the fur-down hitting close to the back seam of the dryer. It is not a fatal problem; the dryers can be sealed into the bay and air flow will work. The final look just highlights the lack of design or coordination. Here is an example of a great laundry room design. This is a nursing home facility. 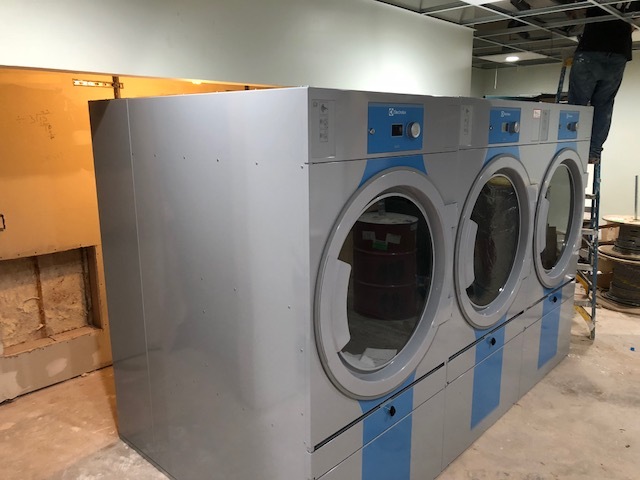 Note that the laundry has been split into two rooms: one for soiled linens that contains the washers and one for clean linens that contains the dryers. 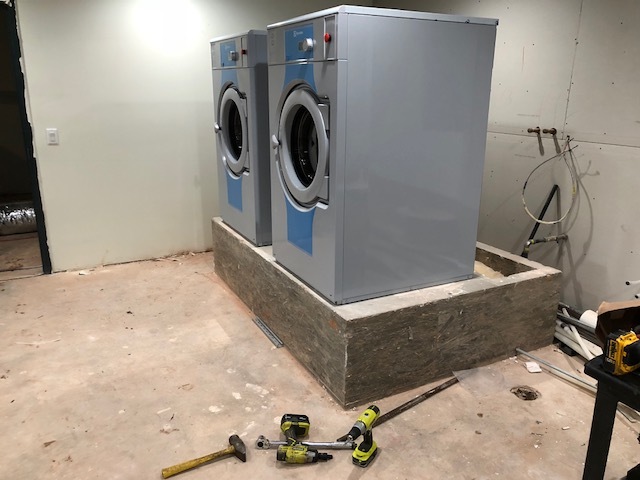 The washer room has plenty of space in front of the washers, is clean, is well-lit, has room behind the washers for repair work, and is walled off from the clean room.